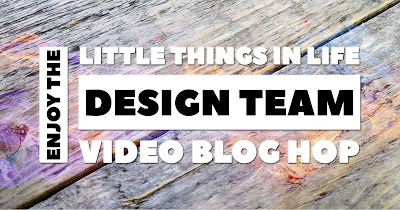 Thank you for joining us for our FIRST Enjoy the Little Things in Life Design Team Video Blog Hop. We are going to be giving you inspiration once a month that will help you to be more creative and give you some great ideas and tips including videos. We have an incredibly amazing team of demonstrators from around the world that are part of this hop! Today I've decided to use the adorable Pieces & Patterns stamp set with the coordinating Pick a Pattern Designer Series Paper. I just love this stuff! I've already used most of the pack haha! I've used cardstock in Emerald Envy, Crushed Curry & Sahara Sand as these are coordinating colours in the Pick a Pattern Designer Series Paper (DSP). I've used the bear & three spot images from the Pieces & Patterns stamp set, picked up all on the one block, & repeatedly stamped them diagonally across the card fronts in Sahara Sand. I've used the Layering Circle Dies for the largest circle (DSP) & the scallop edge (black), & I've used the Stitched Shapes Dies for the sentiment (Crushed Curry, stamped in Basic Black). Then I've used an offcut of the DSP (black) for the strip. I've added some Black Metallic Thread & sequins for bling. I've also stamped the inside of the card with the grouping of stamps in Sahara Sand on a layer of Whisper White. I hope you've enjoyed my cards & video today. You are currently visiting Jessie Holton, please continue around the hop to see all the rest of the great projects with new products - you don't want to miss any!